Tourism in Jerusalem and tourism in Rio de Janeiro is similar and very different. 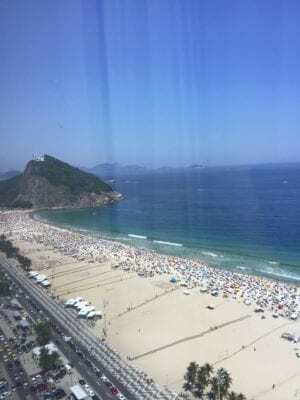 Dr. Peter Tarlow reports from Rio after an all-night flight. He woke up at 7:00 pm at the Rio Marriott Hotel and writes. Much to my shock Copacabana Beach was full and it was still daylight. In my semi-stupor I had forgotten that I was in the Southern Hemisphere and December 21st here is the longest day of the year and the first day of summer. Arriving in Rio de Janeiro almost directly from Jerusalem I realized that I was not only at two geographic ends of the world, but also at two culturally polar opposites. If Jerusalem is a city of sacred modesty then Rio de Janeiro is the exact opposite. Here, perhaps due to the heat, the hidden becomes the transparent. Along the miles of beaches, Cariocas, (the name given to the people of Rio) wear the least amount of clothing possible, even where ascetics might demand more personal discretion. Likewise if Jerusalem is a celebration of the profound, Rio is a celebration of the frivolous and superficial. The locals state that Rio’s culture has three pillars: futebol (soccer), the beach, and carnival. Here work is not a career but an interference in the pursuit of the sensual and the casualness of life. Despite the dissimilarities, sometimes opposites tend to meet. Jerusalem is a city of deep convictions, so deep that at times these convictions manifest themselves in violence. Rio is a city of the here and now, so much so, that the joie de vivre attitude also becomes violent. In one city, violence stems from too much caring, and in the other it stems fro too little. Ironically, both cities’ most famous landmarks have to do with faith. If Jerusalem is dominated by its Dome of The Rock, the Western Wall, and the Church of the Holy Sepulcher, Rio is dominated by Corcovado, its ultimate symbol of Catholicism. In a like manner Israel is in the Middle East but culturally it is not really of the current Middle East. Despite the fact that Jewish life predates Arab civilization by millennia, Israel lies culturally on the periphery of the Middle East. It is a Hebrew speaking island in a sea of Arabic. In a like manner Brazil is in Latin America but not of Latin America. Here the language is Portuguese and Brazilian culture and cuisine are worlds apart from its Spanish speaking neighbors. Just as Israel lies on the Middle East’s edge so too does Brazil and in a real sense that reality is also true of the United States. There is no doubt that both Brazil and Rio are going through a time of political change. The socialist left-leaning governments of the past have been swept away. Socialism, disguised as liberalism, was once seen as the hope of the poor, but now it is viewed as the poison of the downtrodden. People here speak of socialism as the method by which rich white pseudo-intelectuais convinced the poor to stay poor and naive young people are seduced into lives of poverty and disappointments. Although it is way too early even to dare to predict if these political changes will turn poverty into economic opportunity, or merely be one more failed political aspiration, there is a great deal of hope. In that sense there is a great similarity between these two very dissimilar cities. Israel’s national anthem is Ha’Tikva meaning Hope and here in Rio de Janeiro the word most often heard is Esperança: Hope! Perhaps it is hope that unites these two culturally polar opposites and permits the human soul to create light from darkness. Best regards from a land where the sun shines brightly with hope and simple joys.